Imagine you are sitting with a hiring manager discussing a new opening or need. You are seeking a HR professional with a Master’s degree specializing in Labor Relations and at least two plus years of experience. You are aware that University of South Carolina has a well-regarded grad program for Labor Relations. The hiring manager asks: ”What does the market look like for this type of role and what other companies have these people?” Can you immediately answer these questions? Could you walk to the hiring manager’s computer and show them right there on the spot? You can get this data instantly on LinkedIn – you just need to know where to find this information. What’s even better is that LinkedIn is an ideal tool to leverage for instant research/intelligence because the data is actually fresh and frequently updated by the profile owner. There is an area of LinkedIn that is often overlook and I consider it to be a hidden gem. If you look at the menu bar and under “Interests” choose “Education.” This page is primarily designed to be leveraged for connecting with students or fellow alumni from your alma mater. By typing in the school you desire to focus upon, you can begin to use the various filters to slice and dice the alumni information. iii. Click on the “<” icon to the left to return to the specific intelligence. 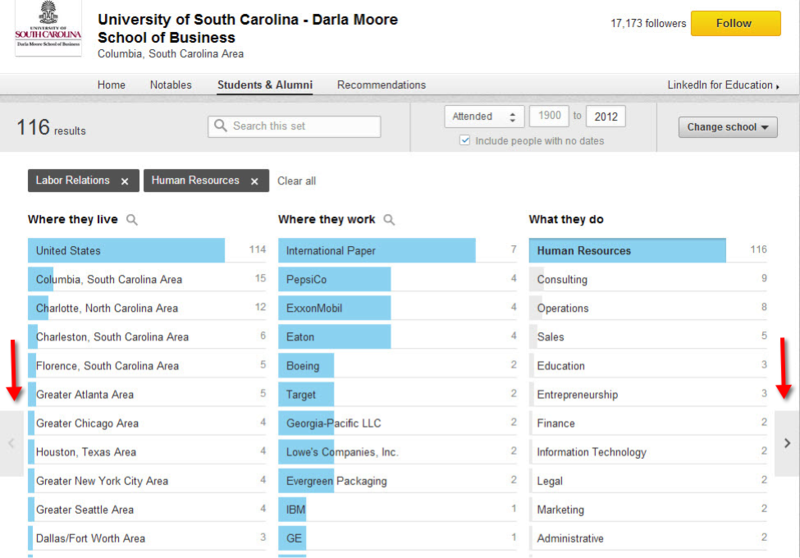 You can see that there are 116 profiles on LinkedIn for people who went to the University of South Carolina and studied Labor Relations or Human Resources. If you are looking for a candidate in Charlotte, you know there are 12 potentials. What companies hire these grads other than PepsiCo? International Paper has seven while Exxon and Eaton each have four. If you then scroll down to the bottom of the page on LinkedIn, the photos and brief profiles of the matching people are there…actual profiles of graduates. Of course you may not be able to see all of the data and profile information, but if you are a first degree connection of an alum of that school, you have a chance to see most profiles. Now that you have the “prospect list” of all the grads from a specific Master’s program by company and location, the key is HOW you now use it. In the scenario from Trick#1, we have been seeking a HR professional with 2 years of experience in Labor Relations. University of South Carolina is identified as a good HR grad school and I already have a “list” of the people that graduated after 2012. Identify one or two highly regarded HR employees of YOUR company who graduated from “South Carolina” after 2012. Arrange a face-to-face meeting and SIT down in person. Hopefully this blog post has shown you how to quickly gather information from LinkedIn and leverage that research to produce additional leads. Personally, I have found by combining these two zero-cost tricks into an overall strategy has helped me to increase my candidate flow by 20% in most cases. The bigger overarching benefit of implementing these tricks are the increased perception of being seen as more of a “consultative” partner because you are bringing data and “new” information to your partners in the recruiting process.